Premium Members have the option to set and receive deals relevant to any departure airport in the world. Q. Why is it so important to set my departure airports? A. If you set your departure airport you will only receive deals relevant to those airports. You can set as many departure airports as you would like and you can change your departure airports at any time. Q. What happens if I do not set my departure airports? A. If you do not set any departure airports you will not receive any deals. We need to know your departure airports so that we know what deals to send to you. 4. 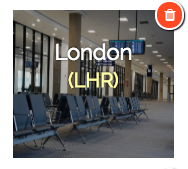 To add a departure airport, type the city name or airport code into the search bar, select the preferred airport, and select “Add” (the "Add" button will appear after you select the airport from the list). 5. To delete a departure airport, select the orange and white trash can symbol.